Global Average Temperatures and CO2. 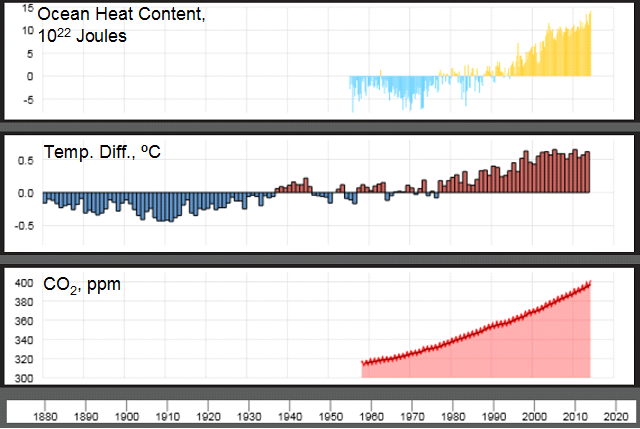 The global average temperature has increased by about 0.7-0.8ºC (1.3-1.4ºF) over pre-industrial values. Humanity’s use of fossil fuels to power industrialization emits carbon dioxide (CO2), a greenhouse gas, leading to warmer average temperatures. Analysis of the increased CO2 levels shows that they arise directly from burning fossil fuels, and not from natural causes (see also the U. S. National Climate Assessment). Climate deniers do not accept that our planet is warming, and/or that human activity is its cause. Climate skeptics may question that human actions are responsible for warming, or that warming is harmful to human populations and other life forms. Here both groups will be called “deniers”. Yearly values of the global average temperature selected for the interval 1980-2013, shown as their difference from the average temperature for the entire 20th century. Other more biased presenters don’t don’t show any data before 1997. These deniers point to the interval after 1997 as showing that the temperature has remained essentially unchanged (here called the “pause”), breaking with the upward trend from 1980 to 1997. Since atmospheric CO2concentrations continued to increase during the pause period (see below), deniers state that increasing atmospheric concentrations of CO2 cannot be the cause for global warming. Deniers cannot selectively choose the data they wish to use while rejecting the entire data set from consideration. It is unacceptable to focus arbitrarily on only the period supporting their view while ignoring the extended global temperature record. Data covering most of the industrial era, 1880-present, are shown below. Yearly values of the global average temperature for 1880-2013, shown as the differences from the average temperature for the entire 20th century. Black points and line, annual average temperature differences; Red line, smoothing obtained as a 5-year running window centered at each data point; Green, error bars showing estimates of uncertainty in the measurements. The overall trend shows a clear, if uneven, rise in the global average temperature beginning at about 1910, coinciding with increasing atmospheric levels of CO2(see below and this post). Importantly, a seemingly long pause also occurred from about 1950-1975, followed by more than 20 years in which the temperature rose sharply. It is noteworthy that deniers fail to mention this earlier pause as evidence that warming has ceased. A Simple Inert Earth Model. Deniers are incorrectly assuming that in the Earth system, the only factor affecting the air temperature around the globe is the amount of CO2 in the atmosphere. 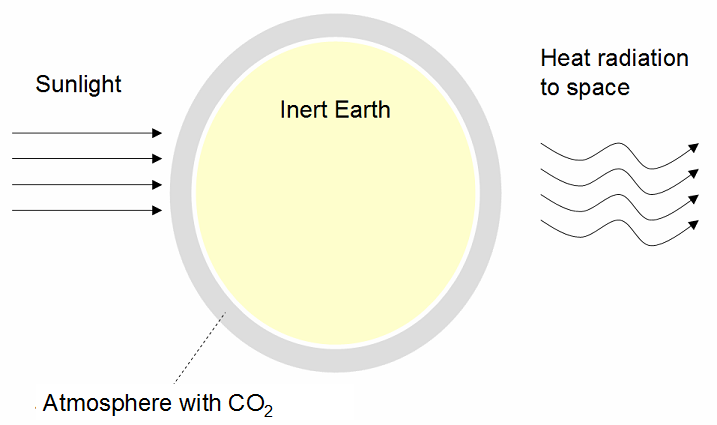 Such a simple model, featuring an inert Earth, may be illustrated using the following graphic. In essence, deniers ignore any additional components in the Earth system that affect the energy balance. A Complex Earth System Model. Why is the Earth’s temperature record so erratic? Why do these pauses occur? The answer to these questions is that the Earth is not a simple object inert to the effects of the sun’s energy. Rather, the Earth is a complex system that responds to inputs of excess energy from the sun in many ways. This can be modeled by a complex Earth system in the image below. 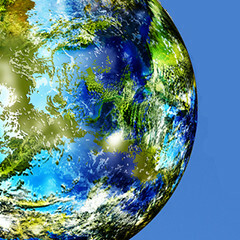 This more realistic model for Earth is not in energy balance. Direct satellite measurements of radiation leaving Earth are compared with sunlight energy reaching the Earth. Because of the greenhouse effect the Earth retains excess heat, rather than re-emitting it back into space. 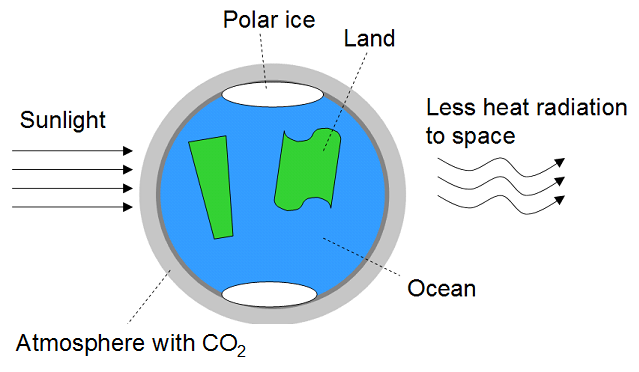 Most of the retained heat is stored in the oceans, and not in the atmosphere. This is why deniers are mistaken by speaking in terms of an inert Earth model, i.e., in assuming that the temperature in the atmosphere is determined only by the atmospheric CO2 concentration. This is shown in the following graphic. Top panel: Total heat energy stored in the top half-mile of Earth’s oceans compared to the average from 1955-2006. Middle panel: Yearly global average temperature compared to the average value for the full 20thcentury (repeating the pattern shown in the earlier graphic). Bottom panel: Direct measurement of atmospheric CO2 from 1958 in parts per million (ppm). Source: National Oceanic and Atmospheric Administration;http://www.climate.gov/maps-data. It is seen from the lower panel that the CO2 concentration has been rising steadily since 1958; indeed a smooth curve such as seen here extends back to pre-industrial times, when the concentration was 280 ppm. The pronounced variability in the temperature data (middle panel) contrasts with the smooth, steady increasing trend seen for CO2. This suggests, as indicated above, that factors other than only the atmospheric CO2 concentration are at play. 90% of the excess heat retained in the Earth system is stored in the oceans. The data in the top panel show that heat energy absorbed by the oceans has been steadily increasing since at least about 1970, including the prior pause of global atmospheric temperature, and has continued to increase even during the current pause. Instead of ending up warming the atmosphere, excess heat has been absorbed into the oceans, warming them (see the Details section at the end of this post). Since oceans have decade-long cycles of vertical as well as lateral currents, this heat remains latent in the oceans, but will eventually be transferred back to the atmosphere, renewing the trend of increasing global atmospheric temperature. 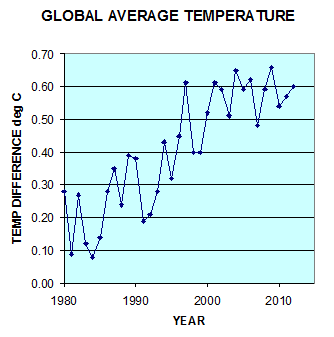 The long-term global average temperature has increased by about 0.7-0.8ºC over pre-industrial temperatures. A current pause of annual global temperatures began after 1997 even though the atmospheric concentration of CO2 continued to increase during this period. Global warming deniers have seized on this pause to say that warming of the Earth has ended, since the air temperature has not responded to the increased CO2 concentration on a year-by-year basis. In fact direct measurements of the Earth’s energy balance show that it does retain excess heat, but does not store it in the atmosphere. Rather, the excess heat enters the oceans. It is stored there as deep as 1,500 m (4,920 ft) in slow-moving ocean currents, both lateral and vertical. As the warmer water is lifted to the surface again, it will exchange this stored heat with the atmosphere, resuming the warming of the air. Similar processes happened in an earlier pause event. Global (atmospheric) warming continues on the extended time scales dictated by Earth system processes. Global warming deniers are mistaken in saying that global warming has ended. Guemas and coworkers (Nature Climate Change vol. 3, pp. 649–653 (2013); doi:10.1038/nclimate1863) examined the current pause in global warming. They used earlier data as a baseline to project sea surface temperatures forward up to 2010 using a coupled ocean-atmosphere climate model. From their results they “attribute the onset of [the pause] to an increase in ocean heat uptake.” They verify that no reduction in the sun’s radiation can explain the pause. Thank Henry for the Post! Henry, ironically the more progress we make in the fight against climate change, the more ammunition deniers have to say it’s a hoax. How that story will end is anyone’s guess, but my intuition leads me to believe it’s going to have to get a lot worse before most of the world takes it seriously. Then, it may be too late. What the deniers are is selfish. They will grasp at anything to excuse not caring about future generations. They even resent being asked to switch to more efficient light bulbs. Thanks for proving that warming is real by use of evidence. Acidification might even be more dire! 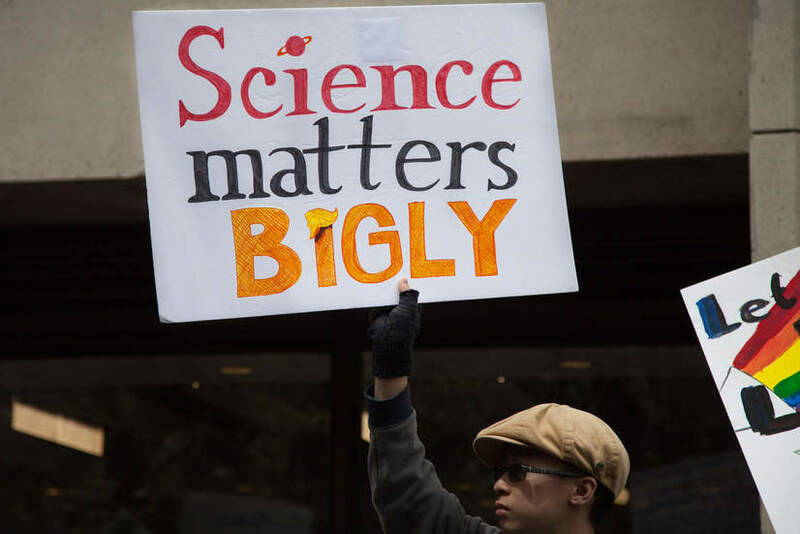 The problem with deniers is that they don’t believe in the so called solutions, any extra taxes – and are, just as their antithesis, afraid of our ability to master the solution – fission without meltdowns. Ya, the other “factors” are acidification, an accelerating belief that such hydrocarbon combustion has no consequences and a decelerating knowledge of the basic scientific precepts necessary to save our butts (from the ills of excess CO2 and depletion). You calling this bs (I often wonder myself due to media sensationalism about basic scientific precepts) ??? According to your logic, we should go back to, say 1960, when the proper nuclear solution was discovered (and thus accurate enough records already available). From there, 54 / 14 = every 3.85 years, a “hottest” year would become. 14 / 3.85 = 3.9 years. So, instead of 13 out of 14, we should have 4 out of 14. However, records do go back a bit further, but then again, I can easily “afford” to be conservative and give you that “but we’re still coming out of the little ice age”. All this number jumbo is just comon sense way to visualize whether or not, warming is accelerating. Howver, not pure science. Pure science is offered ONLY by those who go to college (or otherwise learn it all, including physic, chemestry, astronomy, etc). Granted, the so called solutions are bs where greenies want to have all their power but restrict ours… the only better (and 24/7 reliable) source than depleting fossil fuels is the molten salt reactor (yes, we need to learn nuclear physics, too)! How’s this for reliable data – CO2 is an infrared absorber. It also causes ocean acidification. About as reliable as 2+2, seriously! Now, it doesn’t take a rocket scientist to realize that accelerating emissions = accelerating alteration to the biosphere as it is meant to be in this age, the Holocene (don’t mess with mother nature). Granted, most “solutions” are fallacy (we need a global deployment of molten salt reactors to provide the growing world with reliable 24/7 power, to prevent excess CO2 and of course, eventual depletion into oblivion). Ross, one could use equally legitimate logic to prove the existence of the Easter Bunny. They don’t like the idea of energy being constrained and to have to pay (carbon taxes) at the same time. Surely, most don’t get in to it enough to figure the best energy solutions (so as to trump the problem altogether), however, there is a certain (most probably a great) percentage that do care about the future and “know” that the “lies” of climate change is going to seriously mess with their future via more laws, manipulation of the masses and, of course limitation… which is, ironicly, exacly what is going to happen if we do not develop and deploy the post hydrocarbon solution, advanced nuclear. Only nuclear can give the world the power necessary to clean up the excess CO2 mess, go to space, build giant cities, continue growing for a while longer, and overcome the obsession with… (say it with sarcasm)… “we can do it all with less!”. What’s so bad about meltdowns? So far the West has had 4 of them in commercial LWRs in 2 incidents more than 3 decades apart. The total radiation-related death toll is zero. Damage to the environment is between zero and minuscule. So what’s the problem with fission even WITH meltdowns? By the time the sort of chart you think appropriate shows a dramatic increase, it will be a disaster. The purpose of the anomaly chart is to reveal the trend, not to hide anything. Even talking about a global average temperature is flawed analysis, as some places are warming much more than others. If you plot the trend in the Arctic it is far more dramatic than the average. And it is the Arctic that drives climate in the Northern Hemisphere. Ross, of course I can explain those occurrences. They are what are known as anomalies, or “something that deviates from what is standard, normal, or expected.” They’re often used to extract general conclusions which are unwarranted by those who seek to challenge scientific findings for ideological purposes. Another tactic occasionally employed is challenging evidence based on some arbitrary standard without offering more convincing evidence to refute it, as you’ve done with the historical record. Fortunately, both tactics are fairly obvious, and are more interesting as psychological studies than in anything relating to earth sciences. Public acceptance. We need to keep the old LWR’s running but we really need to do what Alvin Weinberg insisted to do – deploy the MSR globally. It shouldn’t be that big of a deal to re-develop, and there is NO EXCUSE for the public to believe the silly anti nuclear stance on that one. You don’t know science unless you can prove, beyond a doubt that excess infrared absorbers and excess hydrogen ions in our biosphere will pose no problem. 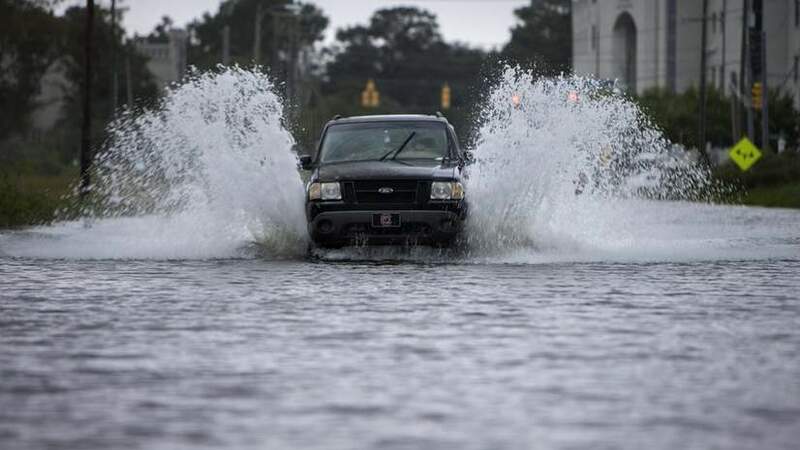 Using weather related events enerally point to warming, but using basic science, physics, and astronomy CONFIRMS an exact and predictable consequence or outcome. Can you prove that this is NOT the highest amount of CO2 in millions of years? What, is that graph from Hawaii all made up? Better get on to a better source of power! All leds are direct current. Only some are made to flicker at 30hertz because the grid cycles at 60hertz. Place a smoothing capacitor in the circuit. Leds will soon be at 200 lumens per watt, beat that. If you had to account for the wastes (of whatever source) and deal with all the capital concerning energy related expenses, perhaps you would want to use less – just like gas. I really like the idea of MSRs. Unfortunately, we have exactly 0 commercial MSR designs available for ordering today. Re-license the LWRs as they come up to the 40-year mark, if they’re maintained in good shape. Yes, losing one is bad PR, but we aren’t building anything that primitive any more and we can’t sacrifice their contribution. Build Gen III+ LWRs of the current designs, to pay off the investment in them and start carbon output trending downward. Push MSR research and get licensable designs (and licensing pathways) ready for when the Gen II and III LWRs start hitting retirement age. I thought you were more concerning. Engineer- Poet, in 1960 it took five years to build a working, 8MW molten-salt reactor. Somehow, in 2014, it will take eleven more years to build a test utility-scale reactor. With all the knowledge we’ve already gained, with all the resources at our disposal, and with three superpowers working on it. This seems nearly unconscionable to me, but I grew up in a time when important public works projects were unhindered by red tape and endless review (two decades before my time, Hoover Dam also took five years). Many mistakes were made; they were fixed with redoubled vigor. Safety was not paramount; workers died, others stepped in to take their place. Litigation was virtually unheard of – if a job was dangerous, workers knew it going in. Most important was the brilliant and determined leadership which made these projects happen, which drove them onward even when a successful outcome appeared hopeless. Those qualities are not culled and rewarded in contemporary culture, and the ability to do so may be lost in time. Prof. Wade Allison makes the point that 50% of the cost of nuclear today is caused by safety-related activities which he states are superfluous. Proponents of nuclear power (like myself) need to recognise that the nuclear option is dead in the water if the perpetual increase of safety related costs is not stopped and reversed. Obviously, the argument that current safety standards are superfluous and too expensive is one that will be received with (unjustified) ridicule by anti-nukes, but I believe that we must have this argument, in line with Prof. Allison’s recommendation. In any case, for the nuclear option to be available to humanity, nuclear safety regulations must be reviewed and corrected according to science, and not according to ‘appeasement’ as Prof. Allison calls it in his presentation in the above video. Hello Robert, there are two peaks in each cycle, so 120 HZ not 30. Looking forward to 200 lumins/watt, but CRI is more important for my eyes. High CRI filtering tends to lower efficiency. Many LEDs do not list CRI, it should be mandatory. I’ll disagree with you on the IFR (current name: S-PRISM). The S-PRISM is a great thing, but even with the axial breeding blankets (breeding ratio 1.22) the required inventory of fissionables keeps the growth rate to something like 3% per year. The ~560 tons of Pu in the USA’s SNF is only sufficient to start about 30 GW of S-PRISMs. If we are going to start that small we need a 10-year doubling time (7% annual growth), not 25 years. If Transatomic Power can make things work on SNF, they could start 500+ GW of units on the USA’s existing inventory of SNF. That would be sufficient. AFAIK, a doubling time of as little as 8 years is possible. Has anyone done this kind of review in a systematic way? It would seem like a good task for the National Academy of Science. That doesn’t appear to include time for fuel to cool and be refabricated. The S-PRISM paper I read assumed 3 core’s worth: one in use, one cooling, one in reprocessing/refabrication. Agreed. I’d like to speculate on this topic a bit. Doing this review in a systematic way needs to (IMO) begin with a fundamental discussion of which definition of ‘safety’ is used. There are three totally different definitions of ‘safety’ which heavily influence the direction and conclusions of any nuclear safety review. Safety can be quantified in relation to an idealised definition of safety: “Zero deaths, zero injuries, now and for ever more”. Compared to this definition, nothing is safe, not nuclear power, not solar power, nothing. This is the definition of ‘safe’ which is typically used (and pushed by antinuclear groups) within the field of nuclear power generation regulation. It is founded on the ALARA principle of radiation protection (As Low As Reasonably Achievable) which assumes that no amount of radioactive exposure is safe except a zero dose. Within the philosophy of ALARA, the only safe nuclear power plant is a power plant that exists only on paper. In this philosophy no operating nuclear power plant is safe, and all nuclear power plants can always be made safer. This has been the driving force leading to exorbitant expenditures on nuclear safety, far beyond anything typically done to increase safety in other (power generation) sectors. Within the nuclear sector, this principle has been driven so far that detailed study is now required to evaluate whether a particular proposed (or politically mandated) new safety measure is in fact increasing or decreasing safety. 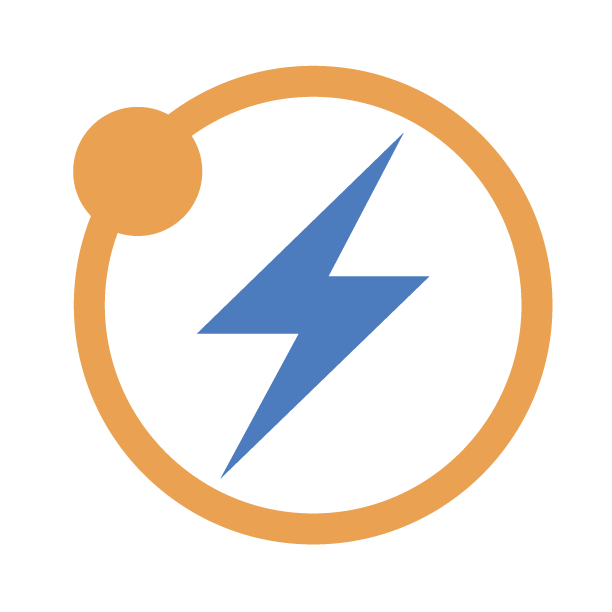 An example is the drive to perpetually increase the number of radiation monitoring and alarm system components in a power plant in order to reduce the risk of radiation exposure to workers. As this number grows, so does the need to monitor and maintain all these components themselves, which in itself can increase the risk of accidental exposure to radiation to the persons doing the checking and maintenance. Another example, anecdotal (which I can’t seem to find the link to now) is a report by a nuclear safety manager who reported that his workers were required to don such heavy and cumbersome protective clothing, that they were afraid of falling down a vertical climbing ladder which they needed to use in the course of their specific safety related task. This clothing was protecting them from an insignificant exposure to radiation. In fact, this manager stated that the risk of falling and injuring themselves was obviously greater than the risk of getting some exposure. This all illustrates that the ALARA principle has already reached limits of diminishing returns not only in terms of cost/benefit (which it reached already in the 1970’s), but even further down the road to the point where an intended (minischule) increase in safety itself causes a (miniscule) decrease in safety as an unintended consequence of the measure. It should be noted – as Wade Allison does in the above video – that the proponents of this defintion of nuclear safety includes a significant portion of those working within the radiological protection profession. These people’s salaries depend on nuclear never being safe. In their drive to support ever increasing safety standards, and thus ever higher cost of nuclear, they are killing the goose that lays the golden eggs. The second definition of ‘safety’ does not assume ‘safe’ to means the complete absence of any risk now and forever, but instead assumes that ‘safe’ should be defined in terms a particular benchmark of (worker) safety, where the worker is assumed to be the person most at risk from any accident or routine operation at the plant. For example, the safety of a nuclear power plant can be compared to the safety of another type of power plant. Without going into this, the fact is that nuclear power plants are already far safer in this sense than any other type of power plant, including solar, hydro, and wind power, let alone biomass or fossil fuels. In fact, a nuclear power plant is safer than a typical office building, which statistically causes more risk of death and injury (falling down stairs, fire hazard, ets) per worker than a nuclear power plant does. So within this ‘looser’ definition, safety regulations for nuclear could already be significantly relaxed. The third definition of safety goes further and uses the most likely alternative to the nuclear power plant as a benchmark for safety. Several parties have begun to do this kind of evaluation of nuclear safety, and have come to stark conclusions. When this definition is used, it is clear that even the worlds aging, existing nuclear plants are incredibly safe: far safer than any other power source. Not only are they safe in their own right (per the second definition of safety described above), but they actually increase the safety of the entire community which would otherwise be subjected to massive death and injury due to the alternative to nuclear, which is some combination of fossil fuels, biomass and intermittent renewables. I see what you mean EP. Could you provide a link to that paper on the S-PRISM, if possible? The second and especially the third definition are clearly the most relevant. Trans Atomic Power’s approach is to require far less startup. The S-PRISMs fuel assembly count and PU/transuranic content fractions are on page 7 of this document. I’m looking for the loading per fuel assembly or total and not finding it. Without rectifiers and capacitors, the led lights up at just one peak, thus flickers at half the grid HZ. I prefer to just use solar and batteries for the “luxery” of direct current which allows me to make bright lights with just a 3.5v panel and a LiFePO4 battery (the panel doesn’t leak any noticable amount at night without a blocking diode). I agree about CRI. This is one reason why I believe the ultimate efficiency will have to be above 300 lm/w before any 200 lm/w led can be in an acceptable range. Perhaps, we’ll have to settle for just 150 lm/w for a CRI of 90, but still far better than florescents. For household lighting, though, I don’t see any problem with using an advanced nuclear powered grid and good ole fashioned resistance bulbs, since lighting is a rather small percentage of overall global energy consumption. Real data is in the fact that excess CO2 is a GHG and causes acidification. The laws of physics can not be denied, thus NO argument based on wildly variable observation points can be used to counter these basic (and well understood) laws of physics. Besides, it is foolish to simply burn our hydrocarbon store (without meaningful objective to transition to nuclear). It will be needed far in future for such things as tires, roads, etc. Now, both deniers and supporters of AGW (mostly) do not fully understand the best way to stop and then, remove, the excess CO2 within the contraints of the totally erroneous political “solutions” widely touted today which is merely conservation, efficiency to the last drop, and a sprinkling of renewables. I love trees and the environment, but I am NOT a greenie which seeks to impose limitation… Modularly mass produced molten salt reactors can be much cheaper (and even safer) than today’s nuclear and renewables/storage. This is an intrinsic fact about the million times more powerful nature of fission because it requires less mass, less mining and less land, and offers almost UNLIMITED energy necessary to power the world without smog and excess CO2 and provide all mobility via electric cars. Wrong. A LED on a half-wave rectifier will cycle at the grid frequency. One on a full-wave rectifier without smoothing will flicker at twice the grid frequency (going dark at both zero crossings). The difficult/expensive part is maintaining a smooth DC input to a LED while also trying to achieve unity power factor and low harmonic generation on the AC end. I can observe the flicker from the alarm clock if I sweep my gaze from side to side. I notice that the stove clock flashes at twice the frequency. I doubted I could be aware of the flicker if it was so high, but should have visualized two peaks as being just one of 60 cycles. Instead, I visualized the current going “back and forth” 1/30th of a second each way. Thanks, I wasn’t paying attention to the fact that there are two peaks in every cycle. Your alarm clock’s display is scanned by the driver chip, not flickering at line frequency. If you look at the circuit diagram you’ll find that there are many fewer drive lines than display segments (pins cost money and every solder joint decreases reliability), and the driver grounds the cathodes of one digit at a time while applying power to the segments to be lit. The other digits remain dark because their grounds are not connected and a back-biased LED doesn’t conduct. After juicing one digit for the appropriate time-slice, the driver moves on to the next one. Key pads are scanned similarly. The driver chip which scans your 104-key keyboard has a lot less than 104 input lines. Everything is multiplexed. I suppose even the Christmas leds flicker due to the driver, too… Thanks for explaining. Oh for God’s sake. You have not heard of abrupt climate change? Or the wealth of solutions? After Donald Trump won the presidential election, hundreds of volunteers around the U.S. came together to “rescue” federal data on climate change, thought to be at risk under the new administration. 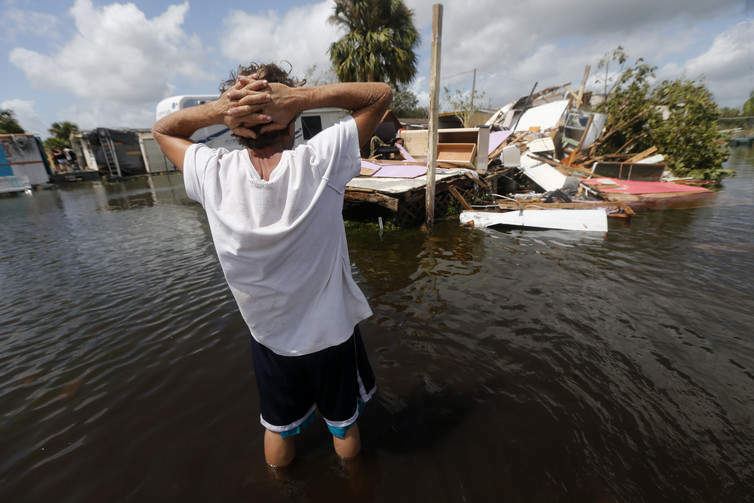 “Guerilla archivists,” including ourselves,..
It’s not easy to hold the nation’s attention for long, but three solid weeks of record-smashing hurricanes directly affecting multiple states and at least 20 million people will do it. Clustered disasters hold our attention in ways that singular..